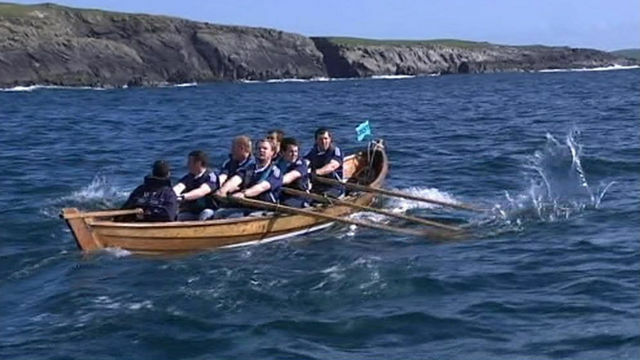 Rowporty features in this documentary which is available on iPlayer until 9:59pm, Monday 29 Aug 2011. Immediately before the prize-giving on Saturday evening, one of our hosts said that their approach to medal-making had been like a primary school sports day — make a lot so all can have prizes. And something similar seems to have happened when trying to write about the event: it’s proven very hard not to write a school sports day report. 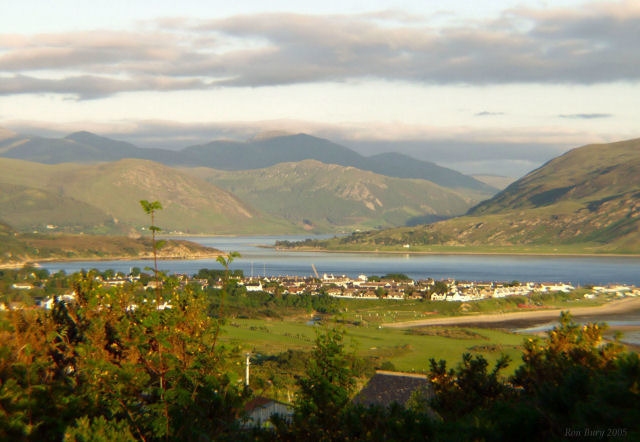 Anyway, first a little background and context: for anyone who hasn’t been to Ullapool, here is a photo of the part of Loch Broom where we rowed. It’s a wonderful amphitheatre with hills sweeping down to the water all round you. Our course on Saturday was — looking at the picture again — from the start a little to the right of the yellow crane on the town’s foreshore, across the loch to a mark just in front of the white blob (a cottage) on the far headland. Then a starboard turn away along the lochside to a mark out of shot on the right. Once round that, the final leg was along the front of the row of houses on the shore line to a finish back by the start line. The weather conditions on Saturday were always breezy, and even blusterous some of the time. But neither rain nor midges! While warming up for the first event, one of our crew was heard to remark that this was the first time this year he could remember racing without a hangover. Well the first leg, into the teeth of the breeze and against the tide, was guaranteed to sweat any toxins out of the system. 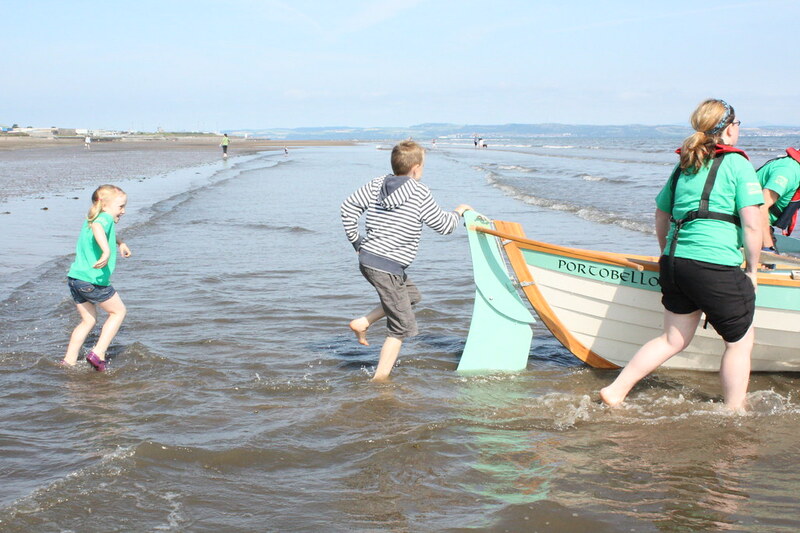 The second leg was relatively sheltered from the breeze and with the tide — fast but not swoopy. But the third leg was right across the tide flow, parallel with any chop that the breeze had kicked up — a guarantee of a hard finish. Our winning row in the men’s 35+ wasn’t as easy as we’d perhaps hoped, in view of commitments later in the schedule. Credit to them, Achiltibue never let up. But two seconds was enough. Our Women’s 35+ faced a blustery first leg — the breeze had kicked up at that point, but we had a swift second leg and an admirable second turn and acceleration out of it (given they’d already been rowing hard for 20 minutes) to overtake Boatie Rows in about 20 strokes — it’s strange how swiftly positions can change. The Ullapool team won that one — justly gratifying for them with their new daily training routine. What about lunch, you may ask? We (the support team anyway) made our own on the beach, after a lightning raid on the local Tescos, and people ate on the run. After two more commanding performances in the Mixed 35+ and Men’s Open (the latter beating Achiltibue into second place…again), the Women’s Open team faced a tough challenge from the locals. After steering an intriguing course into third place on the first leg, they rowed a blinder along the shore, overtaking (it’s not easy to pass someone in a straight line) Boatie Blest about three-quarters of the way along the leg, to finish second. Finally, Achiltibue won — at last! — with our guys a bit tuckered out by their exertions in previous races (for one of our Mixed Open crew it was his third race of the day: next time you are out, try rowing for nearly an hour at full pressure!). So with those results under our belt we adjourned firstly to the pub, then to a ceilidh in the evening. Wonderful inter-generational dancing, a raffle, and prize giving, including the new overall shield which we won by a handsome margin. Then on Sunday, the early morning clouds and midges cleared and most of us went to the barbecue further up the loch, by skiff, traditional sailing boat (think ‘We Didn’t Mean to Go to Sea‘), or car. Meanwhile your correspondent’s team decided to potter off home early so as to be able to take several cups of coffee along the way. True to this spirit, we stopped for a break before even leaving Ullapool. It was really much too nice a place! 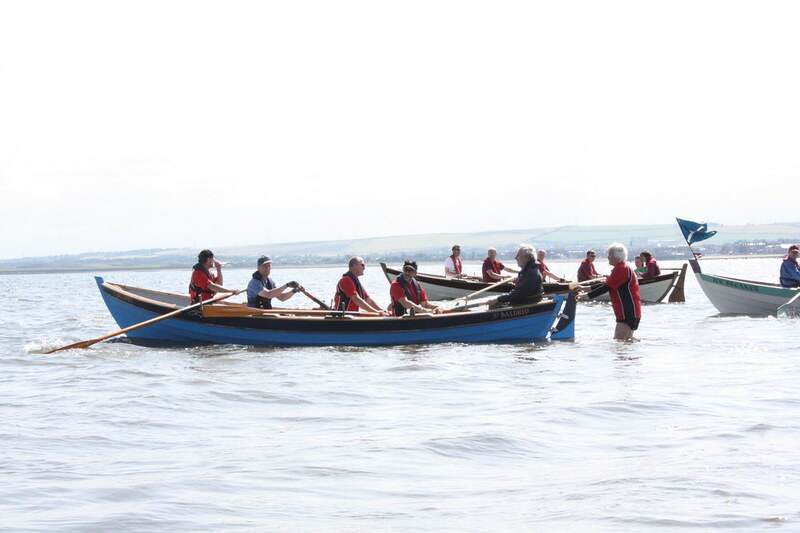 TV documentary featuring Rowporty on Monday, 21:00 on BBC ALBA. Click the link above for more details. 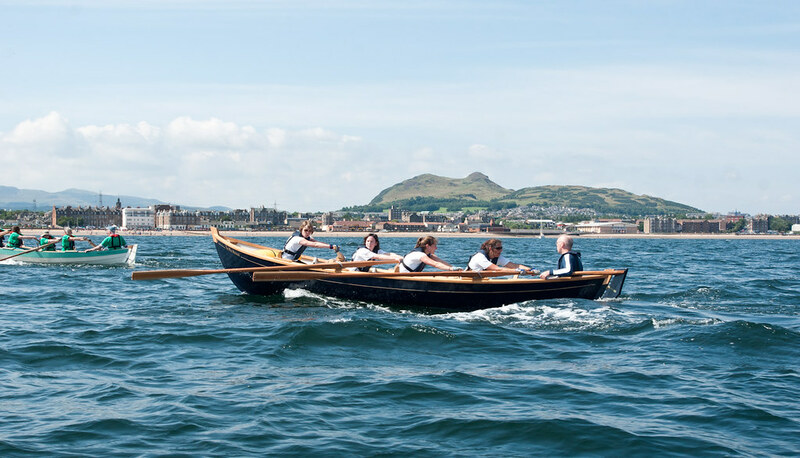 Presumably the photo, above, used to promote the programme is not of a St Ayles Skiff as it has only three rowing stations (with two rowers each), and a very odd arrangement for tiller and cox! 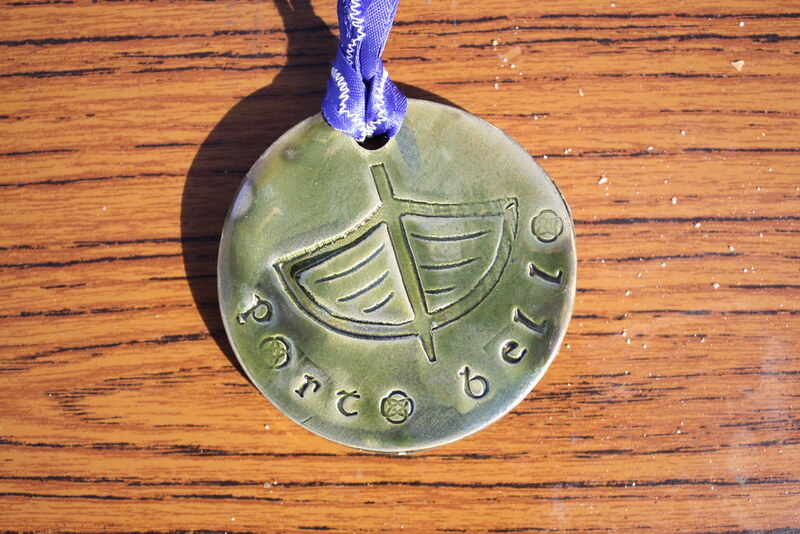 Below are the full results of the Portobello Regatta (revised at 16:30 to correct an error). Note that the course was shortened after Women’s Open from around 3km to 1.5km due to the increasing swell and surf – the time to complete remained much the same! We’re delighted that the Edinburgh Sketcher and his family enjoyed the regatta too. And we love the sketch. 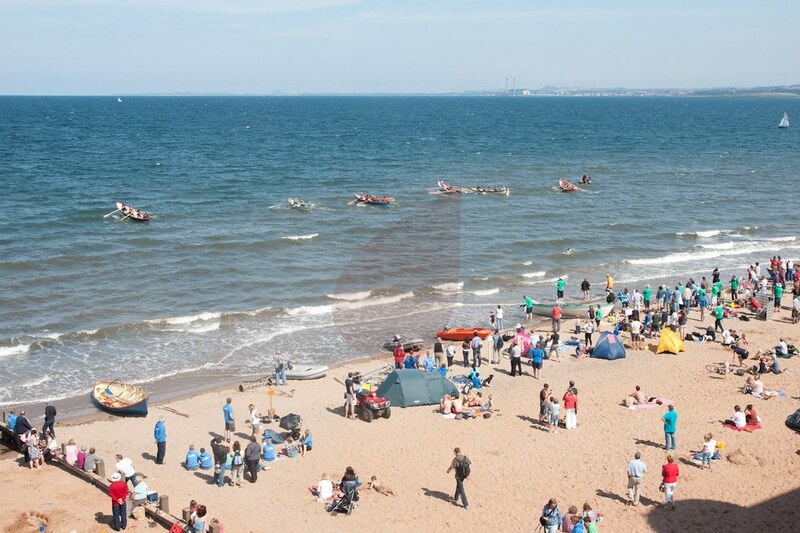 Sun, sea, sand & skiffs: Porty regatta does it again! 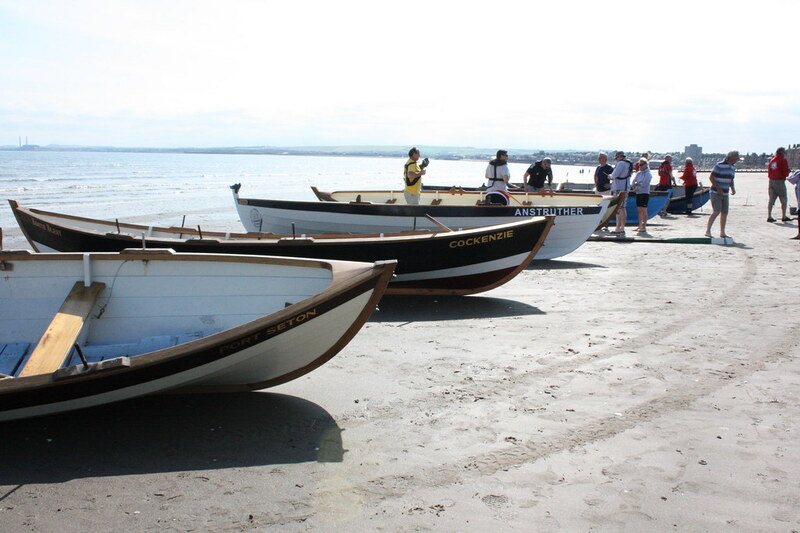 Eleven boats from eight coastal communities across Scotland ready launch for the Portobello Regatta. Some travelled nearly 250 miles to be here. 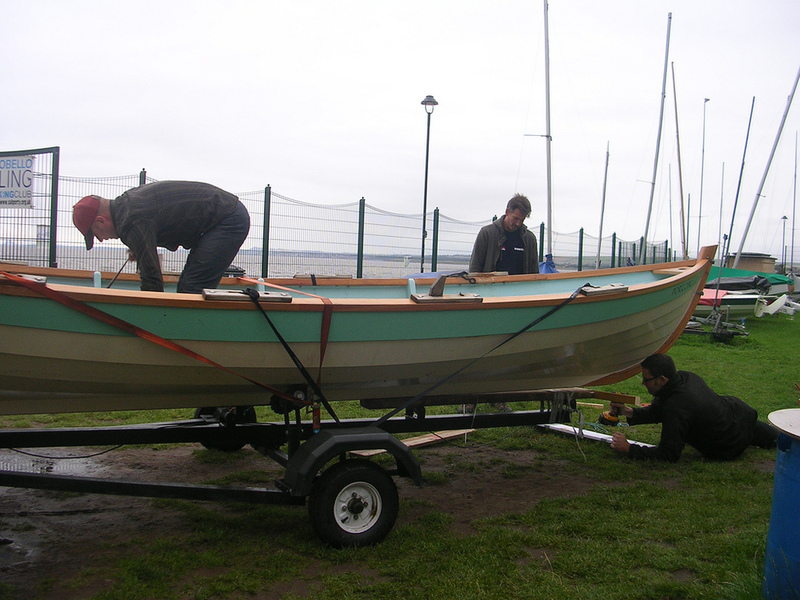 All boats are built by volunteers in the local communities. South Queensferry is one of the latest to catch the rowing bug. Calm seas in the morning. The waves got higher later in the day – and so did the boats! Wee Michael from Newhaven pulling hard towards the finish line. 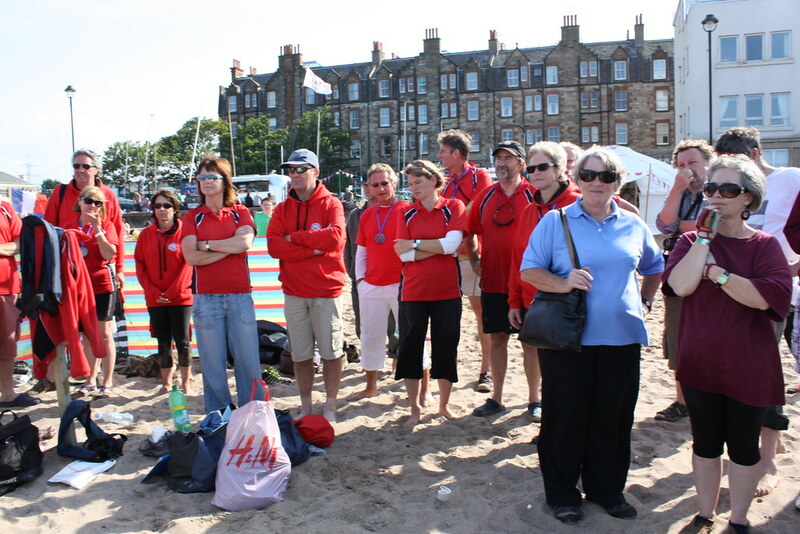 North Berwick watching the rest of their team race in. Feeding teams, friends, families and visitors! 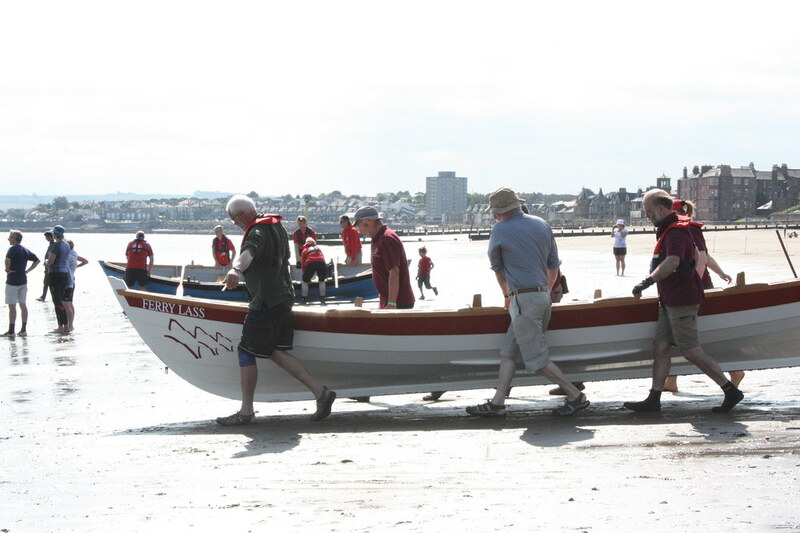 Portobello regatta video as featured in the Caledonian Mercury by rowporty’s David Calder. 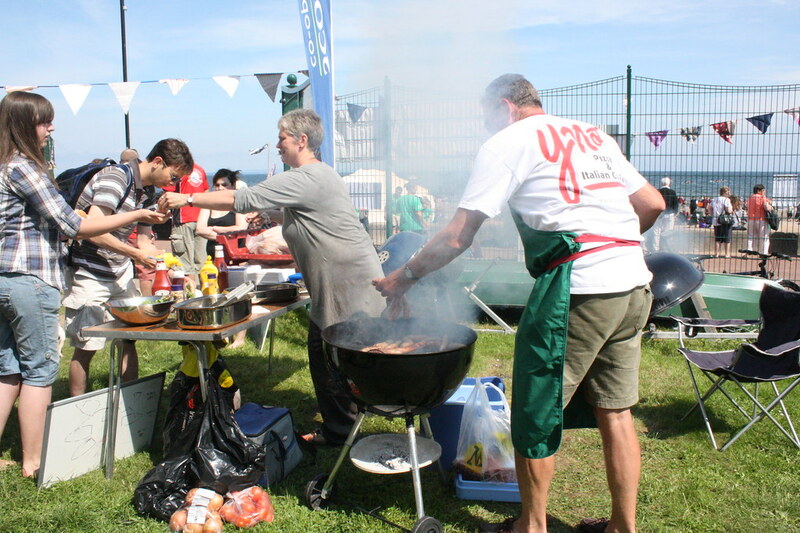 A huge thanks from RowPorty to everyone – near and far – who helped make the regatta such a success! More pictures in the Scottish Coastal Rowing Pool on Flckr. If you have photos of the regatta and of the skiffs, and you use Flickr, why not add them to the pool? Images © Penny Calder, Max Blinkhorn. Click images for attribution. 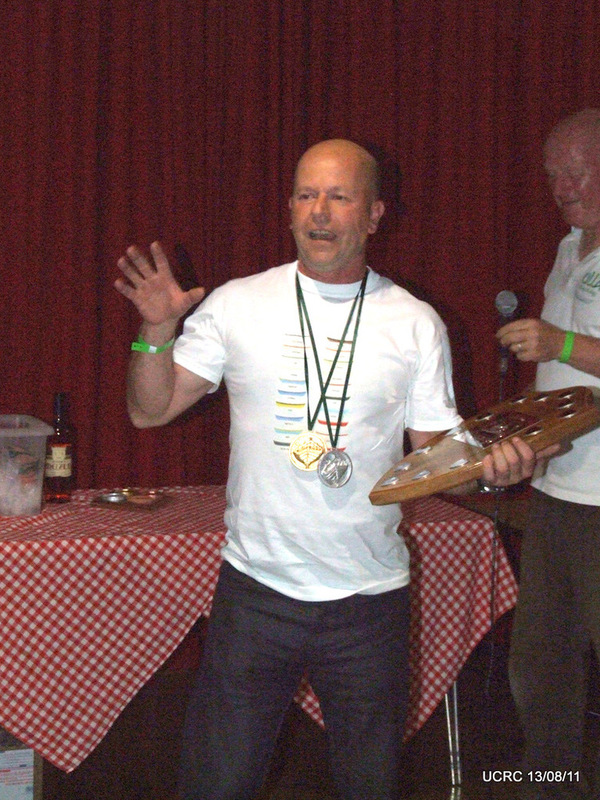 Regatta – success all round!